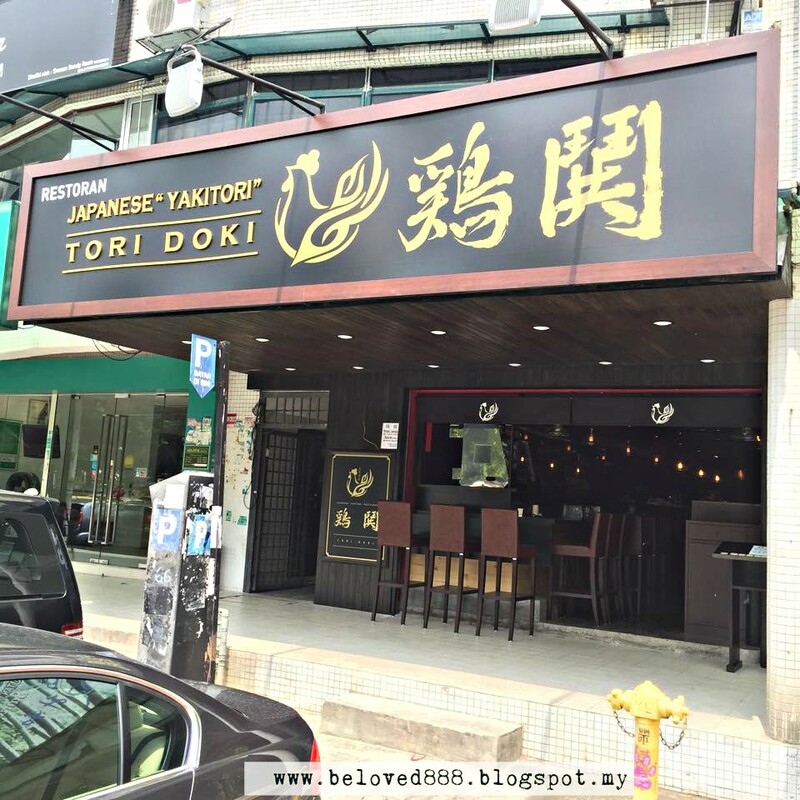 Tori Doki is a Japanese restaurant that located at Sri Hartamas. Sri Hartamas is a busy business center but Toridoki able to capture their customer heart with specially prepare by Chef Joe. 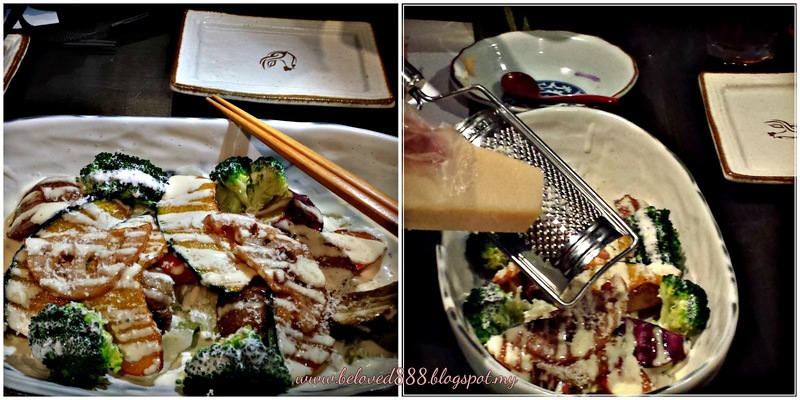 Chef Joe is a humble chef that willing sharing his experience and passion towards Japanese food. The owner welcome us with a warm smile. They served us with Otoshi- Yasai Shiraae (Potato Salad). A simple appetizer but the potato salad has capture my heart. Love it so much and I want more pleaseeee. 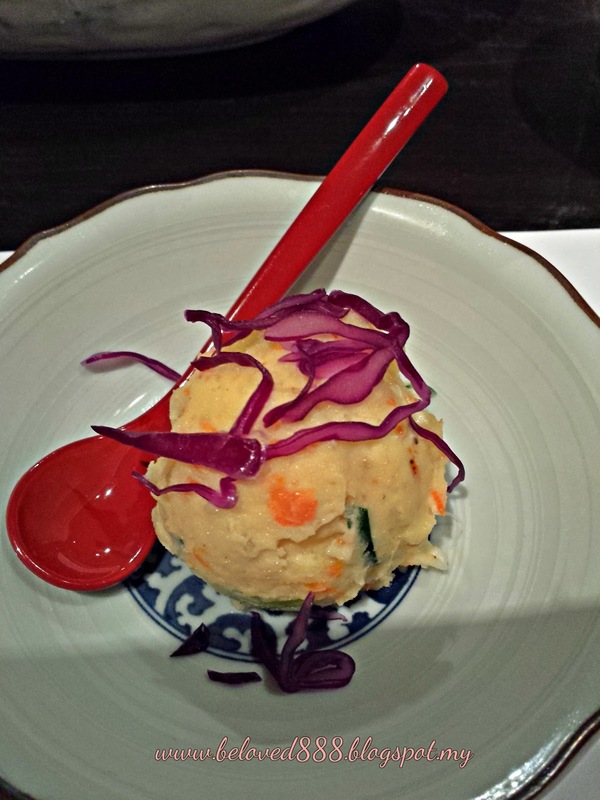 Konsai Salad -Root's Vegetable's salad is one of the healthy food that specially prepare for us. The mix the cabbage, carrot , potato, lotus, pumpkin, broccoli with special dressing and also cheese. One word to describe this dish is "Delicious". A simple and small restaurant actually can satisfied my stomach. What else can I describe regarding Toridoki. Don't let it stop at there as I want share more. Nagaimo Garlic Butter (RM 12) - Japanese yam that prepare using butter and garlic. One bite of the Japanese Yam, you can feel the nice smell of the garlic and it go well with the Yam. 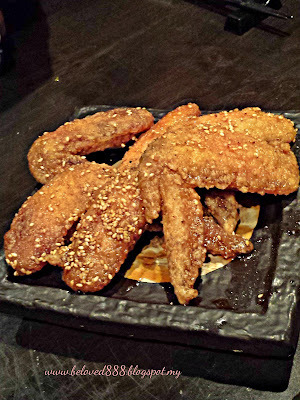 Teba Age (RM 10)- Deep fried chicken wing that has been marinated with soy sauce. The skin of the chicken wing is so crunchy and sweet. No bad the combination. My favourite Chicken Wing. Double thumb for it. This is new to me and I like it. 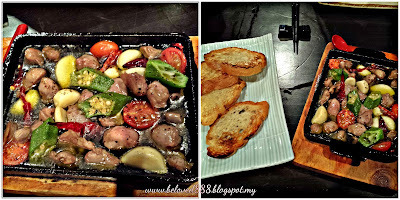 Sunagimo Ahijyo (RM18) is chicken gizzard that cook with 8 kind of vegetables that served in hot plate. According Chef Joe, he using the olive oil to prepare this meal and you eat it with French Loaf. 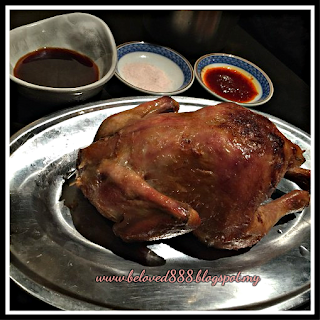 My oh My...When this whole chicken serve in front of me, my saliva nearly drop. Hold it first ya as Camera go first. hehe. Maruyaki (RM 45) is grilled whole chicken . According to Toridoki staff, this is the best seller dish. The chicken is so tender and the chicken's skin is crispy. Try it with 3 different sauces that specially prepare. 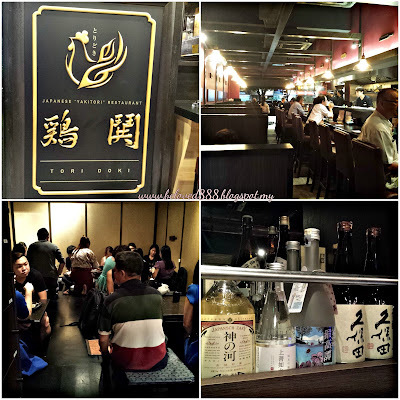 Give a try on their Yakitori. The portion actually is big and I not kidding. The first one is Tsukune (RM 11) is a minced chicken breast with gizzard , Negima (RM5) is chicken breast and Japanese leek and Toridoki (RM 8) is chicken breast and thigh. Which one is my favourite? My answer will be Tsukune. My stomach is so full but I still want try more. Tadaaaaa, introduce to you Dashimaki Tamago (RM14) . One bite of the Tamago, I can feel the softness of the skin and it really different from other Japanese restaurant that we eat. Is so amazing that the Tamago make from thin layer egg crepe and it does not come with rice like what we eat at other Japanese restaurant. Must try this. 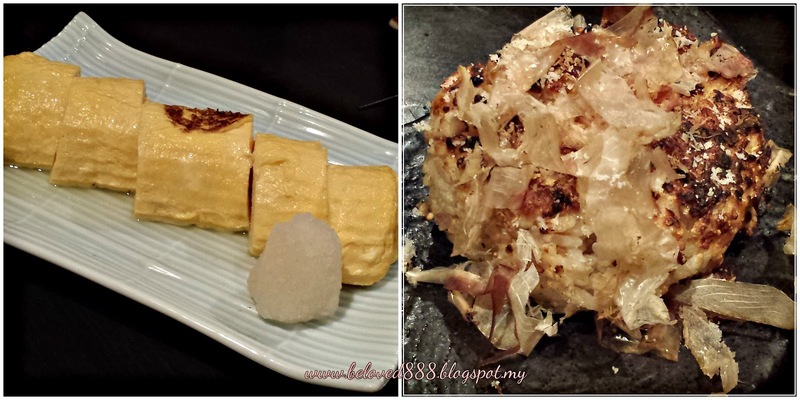 The second dish is Cheese Yaki Onigiri (RM12). The texture of the rice ball is crunchy from outside but the inside texture is soft with camembert cheese. 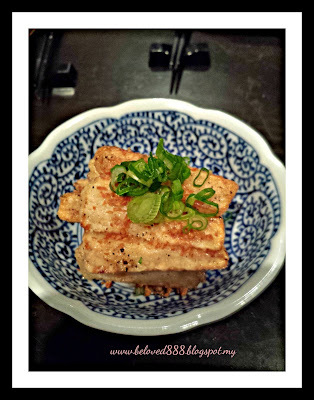 When come to dessert, you must try their Houjicha Pudding (RM10). For your information, this pudding sell like hot cake so reserve it before you order main dishes. 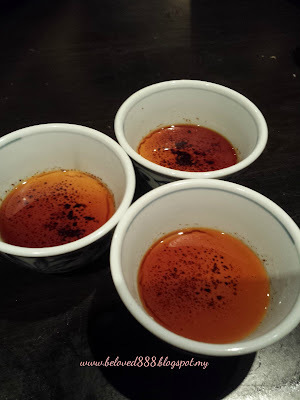 Soft pudding with brown sugar syrup really make my day. Luckily I manage to try this pudding. A clean and comfortable restaurant that come with 3 difference sitting. I love the Tatami seating as I feel like having my dinner in Japanese country. 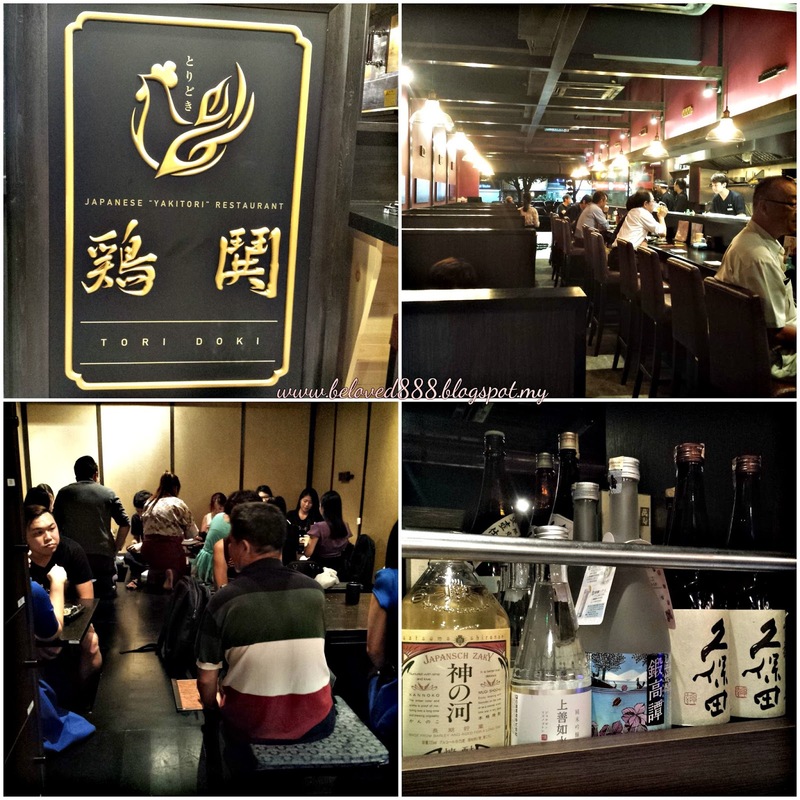 Need assistance regarding the menu, Mr. Kota always willing to recommend the best Japanese food to you. No 40, Jalan 24/70A, Desa Sri Hartamas, Kuala Lumpur, Sri Hartamas, 50480.